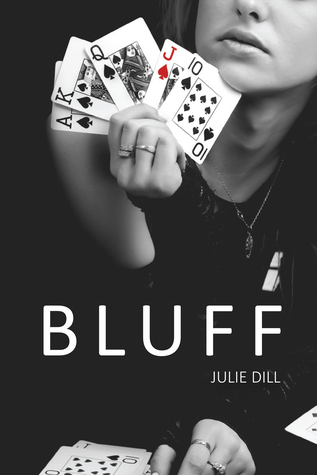 Young adult author Julie Dill joined me this week in the hot seat to discuss the writing life, poker and her debut young adult novel, BLUFF. Your new novel BLUFF is about a 17-year-old girl who sneaks out of the house at night to play poker at a casino. Are any parts of your story based on your real life? I was never in a casino until I was actually old enough, but I did fly to Las Vegas when I turned 21. I had played home poker games with my family with rolls of quarters so I thought I knew enough about the game to join in. Back in the 90’s it was unusual for young women to play so it was a little intimidating, but I did it (and held my own!). Now, I just play recreationally a couple times a year. When my daughters were young I started dabbling with bedtime stories, etc. I became serious when I heard Anna Myers speak at a book festival I attended. She was generous with information about the publishing world, and I was eager to learn. I’ve always been a book lover. What advice do you have for young people interested in writing? Read, read, read. I know that sounds cliché, but reading is the number one practice that will strengthen your writing skills. Also, surround yourself with people that will make you better at what you do. What was the most exciting/surprising part of your publishing journey? It is really exciting to walk in a bookstore and see your project on a shelf. I love to dig around on the world library catalog to see where Bluff has landed. I was super excited to see it has hit many libraries in Singapore. So cool! Should readers be looking for a sequel to BLUFF? Or what are you working on now? Yes, I am working on a sequel. I have a middle grade novel I am revising then my focus will be on the sequel. Writing, for me, just isn’t sitting down to draft. I feel like I’m constantly “writing” throughout my day. I get a lot of my ideas when I run, do laundry, etc. then I carve out time to actually develop those ideas. Julie Dill lives in Oklahoma City where the wind comes sweeping down the plains-literally. As a young girl she always wanted to be a teacher, so she went on to receive her Bachelor’s of Science in Education from the University of Central Oklahoma and taught ten years in elementary schools. Currently, she serves as an adjunct professor and loves helping students achieve success. One of her greatest professional accomplishments is earning her National Board Certification. She holds a Master’s of Fine Arts in Creative Writing from Oklahoma City University and continues to work on various writing projects. From hiking in Colorado, to playing poker in Vegas, she’s always up for a new challenge. Julie is a busy mom of two teenage daughters (send backup! ), and any extra time that she may carve out is spent reading, writing, and rooting for the Oklahoma City Thunder.